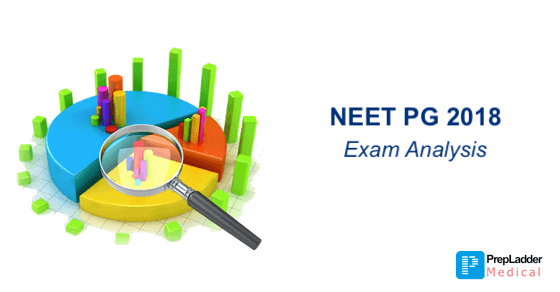 Many candidates who took the NEET PG exam have reviewed it as more difficult than expected. Increased difficulty coupled with negative marking is making a lot of aspirants under confident about their attempt. So we tried to collect information from candidates who took the exam to help you understand how the exam was for others. 8,000+ candidates took the PrepLadder survey shared yesterday. We have tried to consolidate data from all responses and give an accurate picture of the exam standard. Majority of the candidates who appeared for the exam stated that the exam stood ‘Difficult’. Many students have rated the exam as more difficult than November AIIMS and JIPMER exam. ‘One Liners’ seemed to rule NEET PG 2018. Questions were generally one-liners and concept based. There were no clinical scenarios. The exam contained 15-20 image based questions. Marks distribution per subject released earlier by NBE was not strictly followed in the exam. Pharmacology, Medicine, Pathology and OBG. Physiology, ENT, Dermatology, Anesthesia, Pediatrics and FMT. How many questions did candidates attempt? A considerable number of students said that the exam was too lengthy. In our survey 58.9% students said that the exam was easy to finish within 210 minutes, however 41.1% students said that they struggled to finish their exam. 1. Easy question with confusing options in most cases. Candidates usually stated that in many MCQs, the questions were ‘Easy’. However, the distractor options were quite tricky and confusing. Candidates reported that the distractor options were so close that it was difficult to eliminate. 2. Unheard of one liners in some cases. Some questions were unheard of one liners that were not from important topics and were generally difficult. Multiple revisions were required for a good attempt. You don’t need to go deep into a topic, it was more of a factual exam. Many expected and important topics were not asked. Psychiatry questions were mostly unheard of one liners. Options were very close, it was difficult to rule out options. Easy questions were very easy. Cut off will be low this year. NBE had earlier confirmed that the students will be provided with Pen and Paper at their exam centres but most of the candidates complained that at various exam centres they were not provided with Pen and Paper which posed a major difficulty in solving numerical questions. We will try to get a response from NBE on the same. Hope that this blog helps you plan better if you are preparing for the next year’s NEET PG.